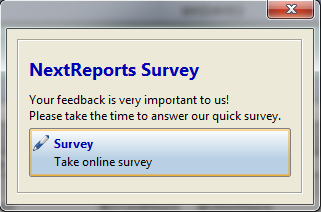 From some time ago, on NextReports site there is a small survey about the product. It can be found here. From 7.1, to make people help us and also the entire NextReports open source community, we will show a small information about the survey on designer and server. This is not an intrusive message, once you click on the link or close the window, it will never show up again for that user. Survey message will show after 10 days from installation, or , for server, if you use old data it may appear right away depending from how long logged user was created. If you want to contribute, please tell us on the survey wizard what are your needs.